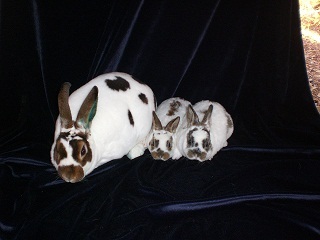 Picture of my verry 1st Mini Rex doe, Sugar, and her 2 daughters from her 1st litter. Mini Rex are one of my favorite breeds of rabbits. I just love their soft, velvet like fur, and sweet dispositions! They make excelent rabbits for childern to start with, as they are small, and easy to handle, and have great temperments! I have been raising Mini Rex for just short time. I got my very 1st pair in the Spring of 2009, and it has grown quite a bit since! I am now pretty much "hooked" with the breed and just love them!!!! Red's, Tort's, Black's, Chocolates, Otters, Blues, Castor's, Broken, and REW. Black, Blue, Blue-Eyed White (BEW), Broken, Castor, Chinchilla, Chocolate, Himalayan, Lilac, Lynx, Opal, Otter, Red, Sable Point, Seal, Tortoise, Red-Eyed White, and now Silver Martin as well. Sable, Smoke pearl, and Tan. Senior Bucks (6 months of age and over) - weight 3 to 4 1/4 lbs. Ideal - 4 lbs. Senior Does (6 months of age and over) - weight 3 1/4 to 4 1/2 lbs. Ideal - 4 1/2 lbs. Junior Bucks/Does (under 6 months of age) - max. wt 3 3/4 lbs. Minimum weight - 2 lbs. Body should be well proportioned, balanced and uniform. Body is to be compact and smooth. Shoulders, midsection and hindquarters are to be well developed and well filled. Depth and with of body should be in balance. When viewed from the side, the topline should rise gradually from the base of the ears to a high point over the center of the hips and then round down to a full hindquarter at the base of the tail. Small dewlaps are allowed in does. Legs should be straight, rather short in lenght and medium to fine in bone. Tail should be proportional to body. Head should balance with the body and be set relatively close to the shoulders. Face and jaws should ne well-filled with a slightly more refined face in does. Eyes shoule be bright and bold. Ears should balance with the body, be thick, short, and carried erect. Ears cannot exceed over 3 1/2 inches in lenght. distinct springy resistance when touched. www.freewebs.com/redelmanrabbitry/varietydescriptions.htm - Good variety descriptions with pictures for reconized varietys. http://mr-colors.tripod.com/ - Color crossing rules for Mini Rex with descripton and pictures. www.nmrrc.net - National Mini Rex Rabbit Club.